Location! Location! Location! Some friends of ours have a lovely villa in Ayia Thekla (about 5 Miles outside of Ayia Napa) and we went to stay with them, we fell in love with Ayia Napa and they tried to convince me to buy a villa near to them, but From Ayia Thekla there is virtually nothing within walking distance. So I set about trying to find a Villa close to Ayia Napa, there were virtually no new villas being built in this area, by a chance meeting we came across the plot we had our Villa built on. The budget went out of the window because we just had to have it. Location! Location! Location! Furnished in a modern style throughout with Air Conditioning in Each Room and Ensuite to Master Bedroom...Large Private pool. The villa is kept to a superb standard. Redecorated annually. That's what it is all about. 5 Minutes walk and your on the Beach..5 Mins walk and your on Nissi avenue, with all of its cosmopolitan Eateries, or 15 Mins walk to Ayia Napa, Centre & The Monestry. Close to all the shops, easy walking distance to lots of Restaurants & Bars, walking distance to local bakeries & supermarkets. Free WiFi and smart Tv Box showing UK TV.....Close to local bus stop. Only 5 mins walk to the wonderful Sandy Bay Beach. 15 mins walk to town centre. 5 Mins drive to Waterworld Waterpark. Its just brilliant for everything. The villa has everything you need its just like a home from home. Chill out in the evening on the spacious roof terrace, whilst taking in the sunset over the sea. Sunbathe by the pool during the day without having to get up at 8 am with your towel to secure a sunbed, as is the way at the large hotels, Eat when you want, Fire up the BBQ. Villa holidays allow you to do what you want when you want to do it. Huge bathroom, full separate power shower, corner bath for 2, also with shower over, vanity unit and mirror. Cupboards. en-suite (bed 1) with power shower, wash basin, toilet, mirror. downstairs toilet and wash basin. Modern furniture huge 6 seat "L" shaped leather sofa, leather arm chair, foot stool, tables, lamps, flat screen lcd hd tv with usb port for you to watch any films you bring with you, dvd player with stacks of dvds, modern wall pictures. Air conditioning. Modern kitchen, well equipped with full oven, hob, microwave, full fridge freezer with ice maker, sandwich maker, toaster, kettle, washing machine, iron ironing board, water dispenser, and all the utensils needed to cook a 5 course meal. Cyprus is one of those rare countries that provides both skiing and sun bathing. Troodos mountains have skiing between January and March, on the mountain Mt Olympus. Troodos mountains are approx 1hrs drive from the villa. Had an absolutely brilliant week at this beautiful villa. The pictures don't do it justice. The villa is so spacious and clean. Everything has been thought about to give you a real feel of home. John the owner answered all my questions very promptly and even down to letting us have a late check out was no problem. Our daughter was getting married at nissi beach hotel. It took us around 15 minutes to walk there. It was about a 10 minute walk to the nearest beach. There are plenty of restaurants and shops. It's in a quiet area so you don't get to hear all the noise from the main roads. The only problem we had was we could of done with an extra key as when one of us was in early we had to leave the patio unlocked otherwise we couldnt put the aircon on. But as it's such a quiet area it wasn't a big deal. I would have no problem recommending this villa. Thanks John for a stress free booking. My family (2 adults, 3 children aged 10, 12 and 15) stayed at the villa in August 2018. For us, it was the perfect holiday. The Villa was amazing, it had everything we could have asked (hoped) for. As other reviewers have mentioned, it is in very close proximity to the main Nissi Avenue where all the restaurants/supermarkets are and very close to the Sandy Bay beach, which was lovely, and had good watersports . Anything that wasn't quite walking distance (in 30+ degree heat) was only EUR10 in a taxi (such as the harbour and the waterpark). All the restaurants we tried were of good quality and the staff very friendly. For us though, the pool was the star. It was an excellent size and in shade from about 3pm which was perfect as it meant that the kids could play as long as they wanted and wouldn't get burnt. There are still lots of places for the sun worshippers out there! The roof in particular is a secluded suntrap. In regards to air conditioning, the owner was spot-on when he said that you didn't need it lower than, say 27 degrees. This might seem high, but it works perfectly and means you won't go over your electricity limit. Any lower, and we felt cold in the morning. The house is well looked after. Various people came throughout our holiday to tend the pool and plants, but they were very polite and unintrusive. John, the owner, was great. He provided us with the number of a reliable taxi firm to get us from the airport and was available when needed. It was a pleasure dealing with him. We enjoyed it so much that I am already considering a return trip next year!! we very much enjoyed our stay at sunshine villa, it was very comfortable, and the owner 'john' was extremely helpful with any queries we had.. and very friendly. the villa is just a short walk away from all the restaurants shops etc..
would highly recommend this villa! Beautiful villa with a fabulous pool! Just returned from our first visit to Villa Sunshine but it certainly won't be our last! John (the owner) could not have been more helpful and we settled in really quickly for our relaxing break. The walk into Ayia Napa was fine but I'd suggest hiring a car to get around, particularly if you want to venture a little further. I couldn't recommend the villa enough. Perfect! Perfect location. Luxurious villa. Immaculately clean. My wife and I stayed at the villa with our sons who are 22 and 20, our daughter who is 17 and her boyfriend. The location was perfect-only a 10 minute walk for the youngsters to enjoy the nightlife in Ayai Napa but lovely and tranquil for us to relax and enjoy the villa. Everything was spotless and worked as it should and the owner was very helpful with any questions we had. I would recommend a stay at this villa for anyone wishing to visit this area of Cyprus. The area, the villa is located, is a superb base for those who would like something different, If you like to walk or cycle there are miles of off the beaten track areas to explore. You can walk/cycle between Nissi Beach to Ayia Napa Harbour and then onto Protaras if you wish. In between Ayia Napa and Protaras you will find Cape Greko National Park, with all of flora and fauna, coves and sea front caves to explore. Horse riding is also available in Cape Greko. About an hours drive you will find the Troodos Mountain range with all its trails and traditions to explore, if you go onto the top of Mt Olympus on a clear day you can see all of the islands coastline. A truly fantastic sight. If you would like to learn how to Scuba dive I would recommend 'Lucky Divers' in Ayia Napa, they will take you down to Nissi Beach and take you through the basics of diving, then it's off into the Turquoise water to have the experience of a life time. For those experienced divers, dive sites are aplenty. 5 minutes walk will take you to the nearest beach which is the beautiful Sandy Bay. This is a small enclave with lovely blue water there is a beach shack serving drinks and meals, also a few water sports, sunbeds can be hired. A further 5 minutes walk along the beach front path is Nissi Beach, this is a lot more lively, DJ music all water sports, bungee jumping, bars, restaurants, foam parties etc. 15 minute walk takes you to various other secluded beaches, Macronnisis, Lantra and Ayia Thekla. 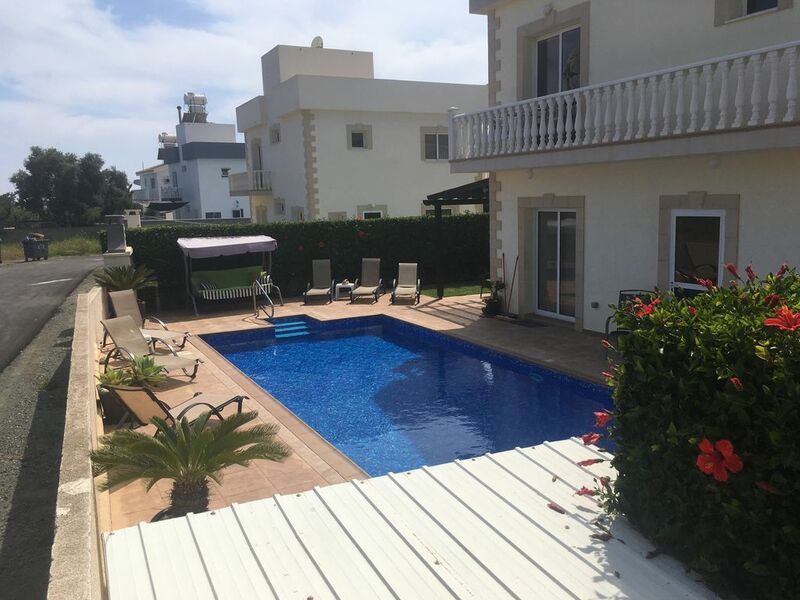 The nearest airport to the villa is Larnaca it will take you approx 35 mins in a taxi to reach the villa, and it will cost you about 90 Euros Return (We can arrange transfers). The position of the villa means that you do not need a car, but if you do like to explore, car hire is not that expensive, the Cypriots drive on the same side of the road as the British. All of the road signs are in English and Greek so you will always know where you are. Paphos Airport is around 2hrs drive, all motorway. Cyprus has 340 days of sunshine each year, with a hot summer and mild winters (comparable to anything the Canaries has to offer). In the winter months you can go skiing and the drive back to the villa and do some sunbathing. English is widely spoken and there are a enough banks and cash machines to cater for all your needs. If you like walking, cycling, being informed or entertained or just relaxing Cyprus has it all. I would recommend a night at the Los Bandidos Mexican in Ayia Napa for a good night out, you have a great meal and a great time! The small villages of Sotira, Freneros and Vrysoulles, surrounding Ayia Napa are full of great little Tavernas where you can eat and drink all night for around 20 euros. Hire a car and go exploring, if go to Nicosia the only city in the world which is split by two countries, Viewing points allow you to see the Turkish and the Cypriot sides of the divided city together. Now you can even cross the border on foot and dine and drink in the other side of Cyprus. Drive up to the Troodos and go to Mt Olympus, the views are simply breathtaking the little mountain villages offer all sorts of different experiences from wine tasting and dancing to simply sitting down for a meal and enjoying the local way of life. Walk along into Ayia Napa harbour and take a boat trip to see the Deserted City of Famagusta, do some diving or swimming then chill out whilst the captain serves lunch. There is so much to do you simply cannot list it all, try Cyprus and have a great holiday, and the one thing you're certain to do is, come back again.